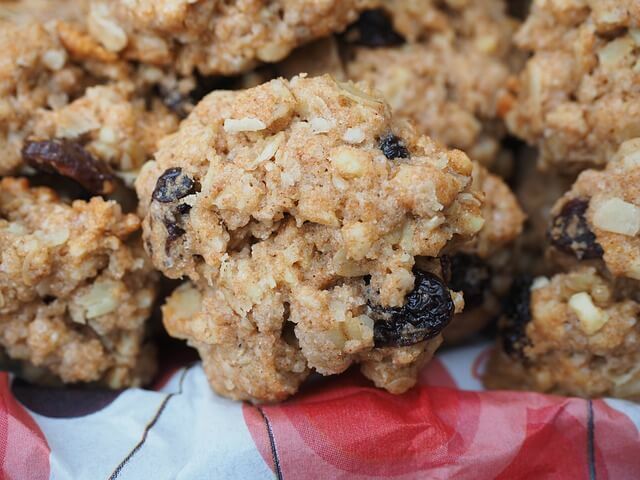 This egg-less cookies recipe is really easy to follow. The dough freezes OK, but you need to defrost it completely before forming the biscuits and cooking them. These cookies are healthy, but you can make them even healthier by swapping some of the sugar for something like Stevia. Mix everything except the raisins thoroughly. When that is done add the sultanas or raisins. Lightly grease a baking sheet and drop a tablespoon of the batter onto the sheet and slide it into the oven before the batter spreads too far. Cool for a few minutes on the baking sheet and move them to a wire rack to finish cooling. You can add vanilla to these egg free cookies to give them a slightly different flavour. It is possible to use other dried fruits, but you should soak things like apricots for a couple of hours in tea and chop them finely before adding them to the dough/batter mixture. If you like to use your microwave follow this recipe. They come out a bit chewy for my taste, but they are a good alternative for those who do not want to waste a lot of energy heating up the oven for a single tray of biscuits. Unless you have a big microwave you will have to cook these cookies in batches, which means that you need to set aside around 45 minutes. Therefore, if you are looking for a fast recipe it is faster for you to use your oven.